Inspect windows for gaps, cracks or air leaks. Caulk around window openings on the outside and around the window’s trim on the inside. Seal off air leaks with weather stripping. Install storm windows or apply heat-shrink film for an added layer of protection. If these tips don’t solve your problem, it may be time to replace them. 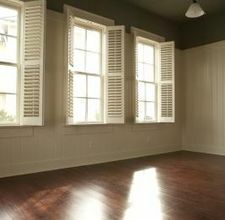 Install ENERGY STAR windows by 12/31/11 for a tax credit (see my July 20 blog post for more info. ), as well as energy savings. At the same time, you’ll give your home an updated look, boosting that all-important curb appeal!